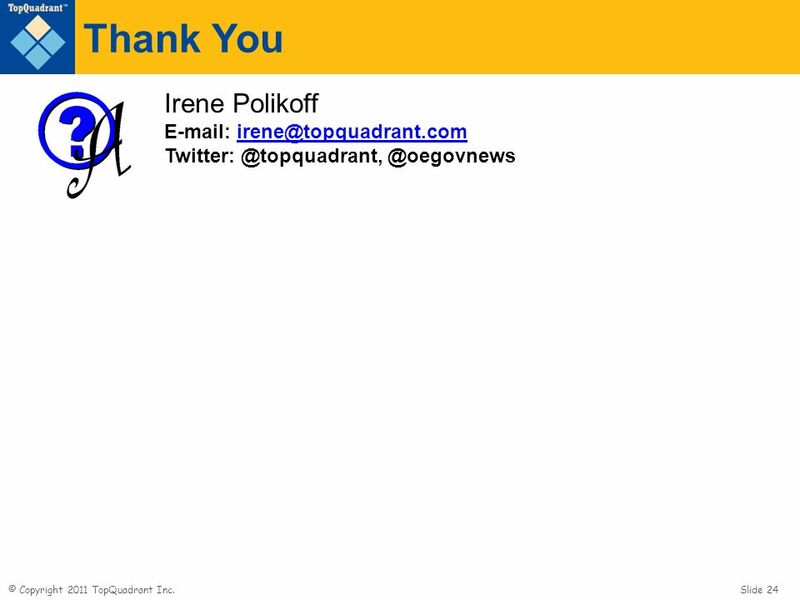 Irene Polikoff, Ralph Hodgson TopQuadrant June 29-30, 2011 "Valuing the Role of Semantic Web Technologies - A Ten Year Personal Reflection and a Vision For The Next Ten Years" In government projects, we have worked on the questions: "What does the use of semantic technology mean to the users of data? 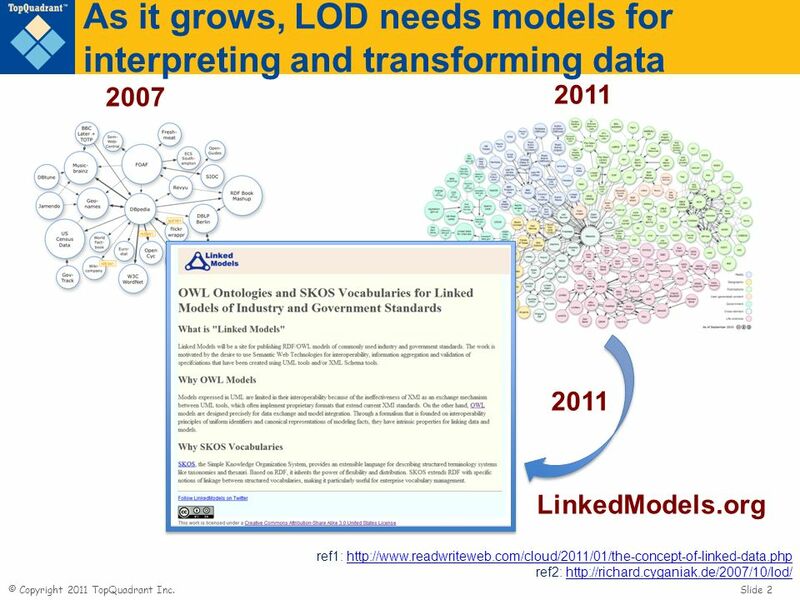 ", "Can semantic web technologies 'connect the dots' and break down data silos? 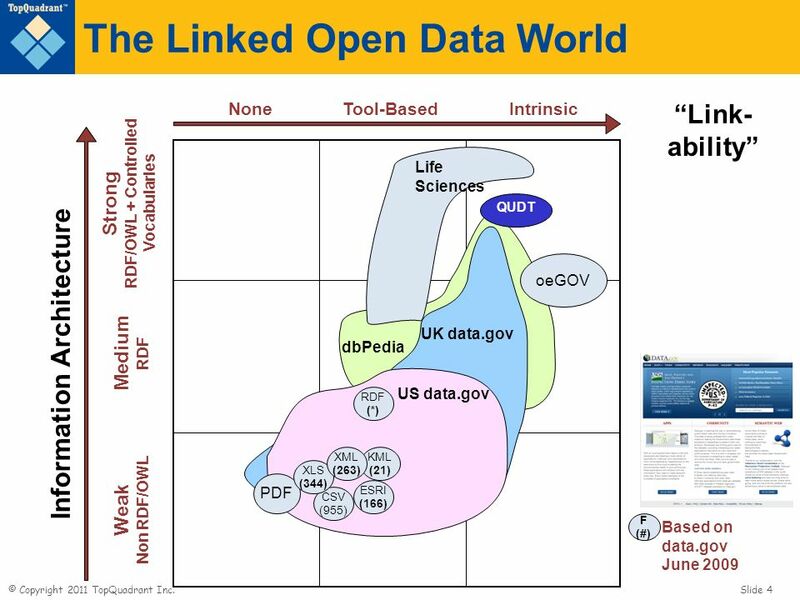 ", "What does it mean to link data? 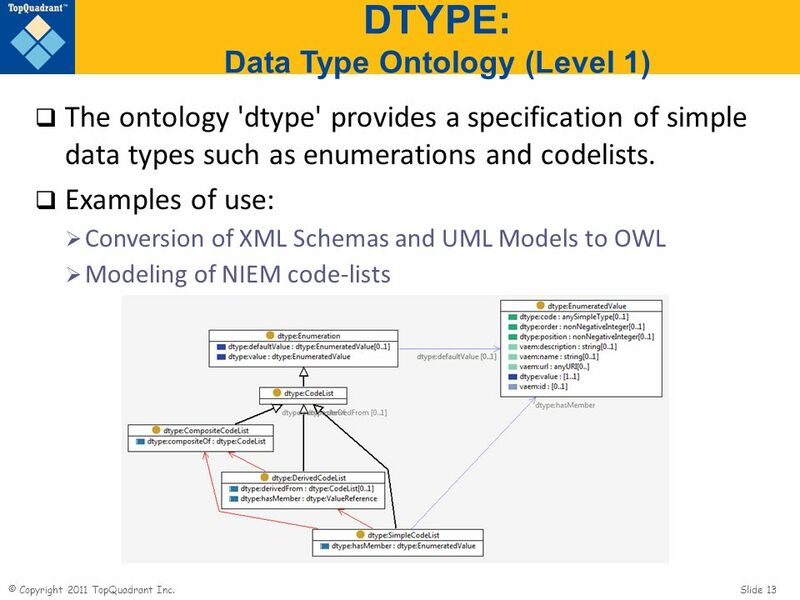 ", "How can data access and visualization be improved?”, “How do Ontology models help data interoperability?”, "How can RDF and OWL co-exist with XML? ", "What has to happen in an organization for semantic web technologies to be put to work effectively? ", "what are the criteria for choosing technologies for implementing solutions?". The talk will address these questions with examples from government organizations where, data has mission criticality, and there are significant challenges to data aggregation and interoperability. 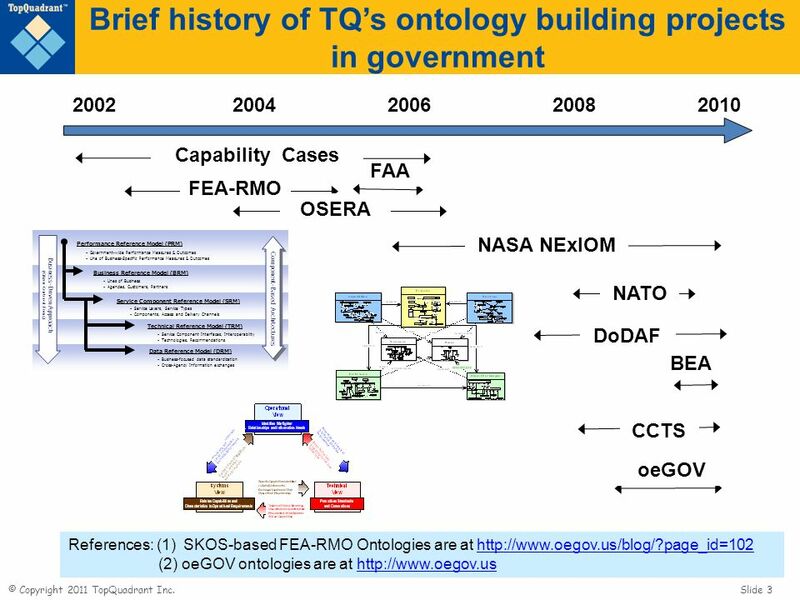 At GSA, in 2003 my company created the FEA ontologies. Since 2002, at NASA, we have worked on the use of semantic technology in data architecture, systems engineering, simulation and Modeling, and Telemetry and Commanding for Space Systems Interoperability in support of Manned Space Missions. At the Netherlands Ministry of Justice, semantic technology is being used to generate XML Schemas that are compliant with UN/CEFACT Core Component Technical Specifications (CCTS). 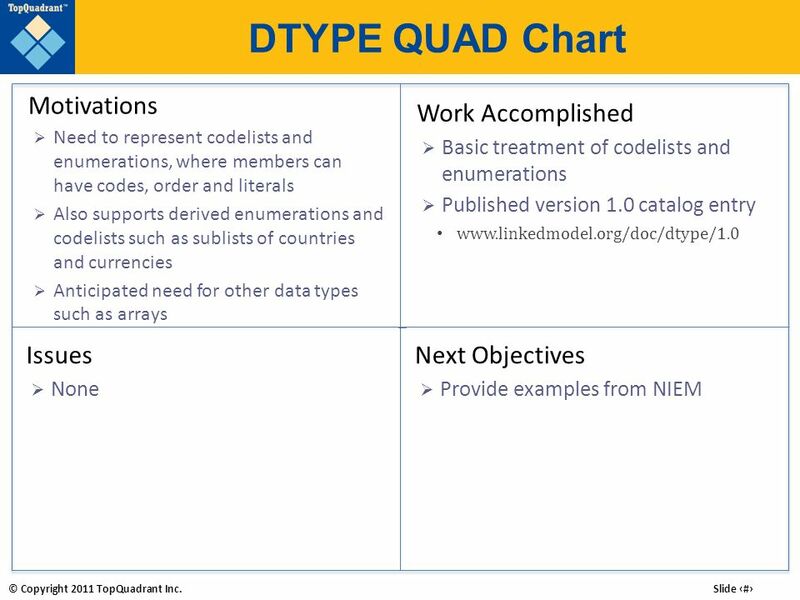 In other projects semantic web technologies are being used to standardize vocabularies. 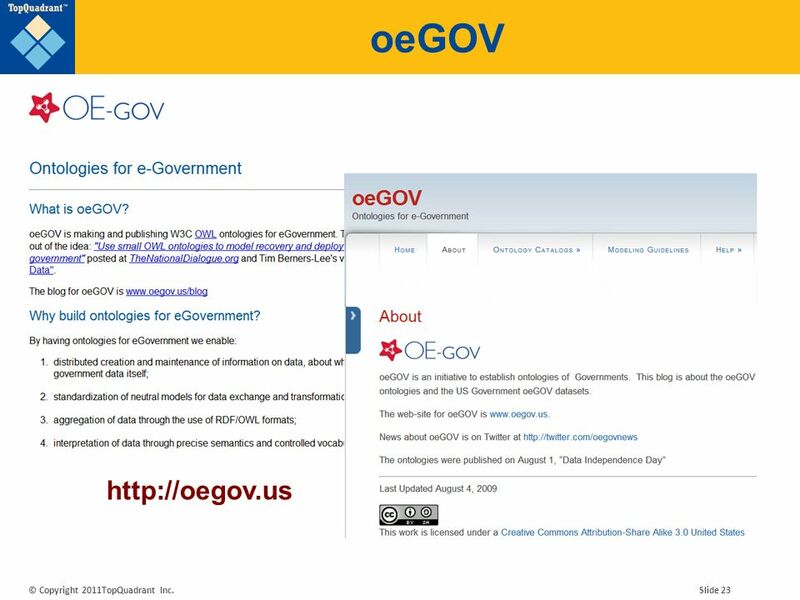 oeGOV.us was a personal effort to ontologize the structure of the US Government. 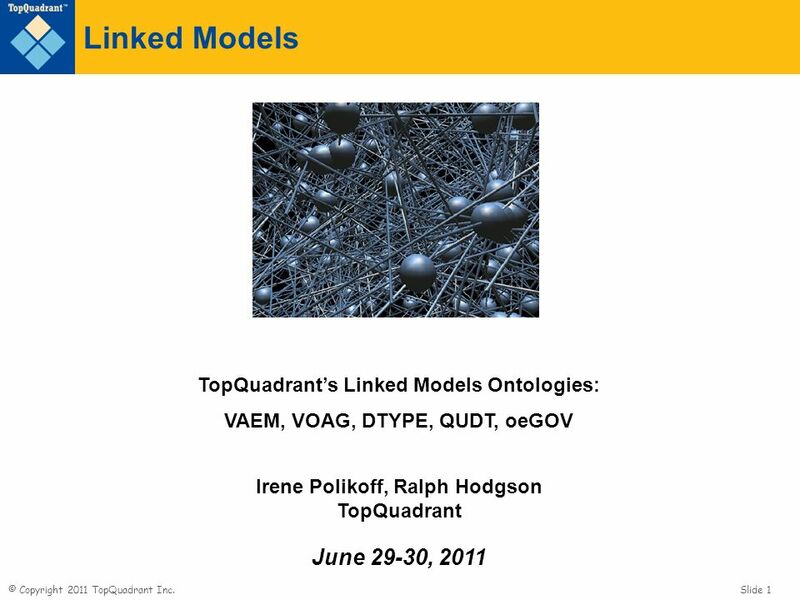 All these efforts offer lessons on "how to put ontologies to work". This workshop offers us all a way to share predictions and plans for the next ten years. 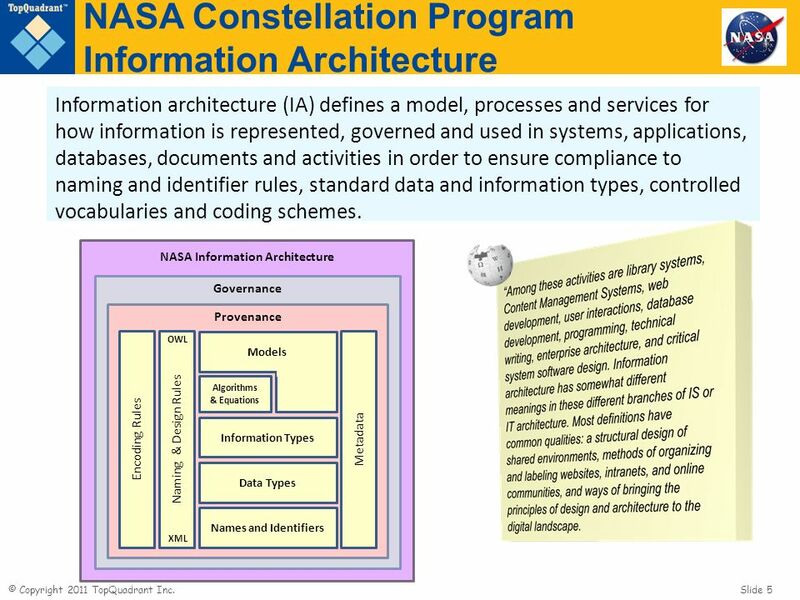 Information architecture (IA) defines a model, processes and services for how information is represented, governed and used in systems, applications, databases, documents and activities in order to ensure compliance to naming and identifier rules, standard data and information types, controlled vocabularies and coding schemes. 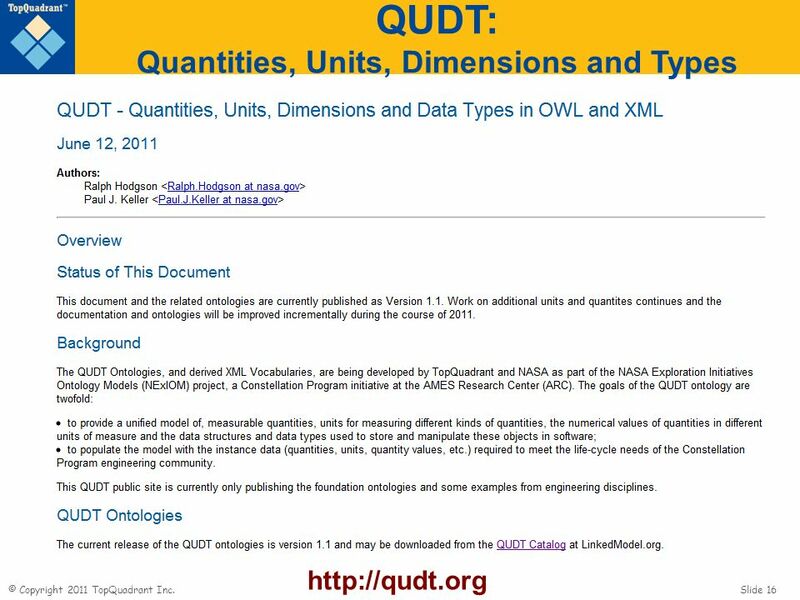 NASA Information Architecture Governance Provenance Names and Identifiers Data Types Information Types Algorithms & Equations Encoding Rules Naming & Design Rules Metadata XML OWL Models In the context of information systems design, information architecture refers to the analysis and design of the data stored by information systems, concentrating on entities, their attributes, and their interrelationships. 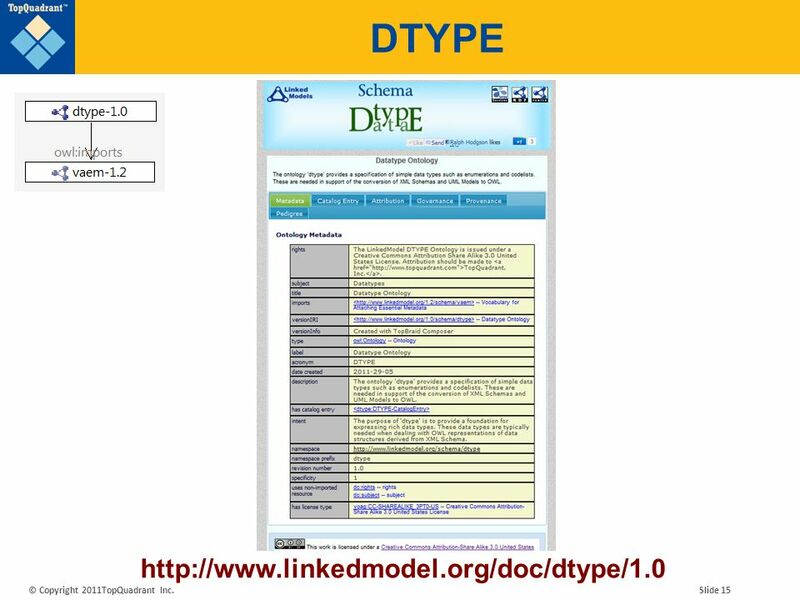 It refers to the modeling of data for an individual database and to the corporate data models an enterprise uses to coordinate the definition of data in several (perhaps scores or hundreds) of distinct databases. 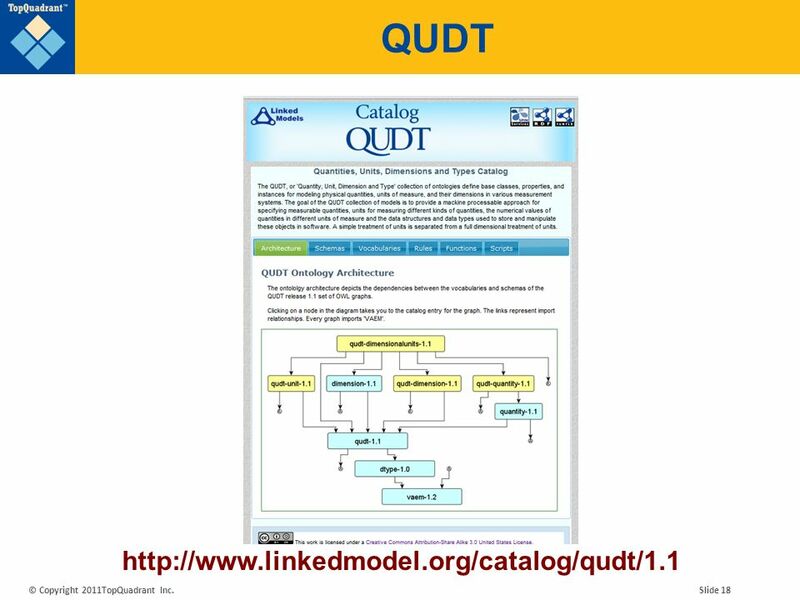 The "canonical data model" is applied to integration technologies as a definition for specific data passed between the systems of an enterprise. At a higher level of abstraction it may also refer to the definition of data stores. 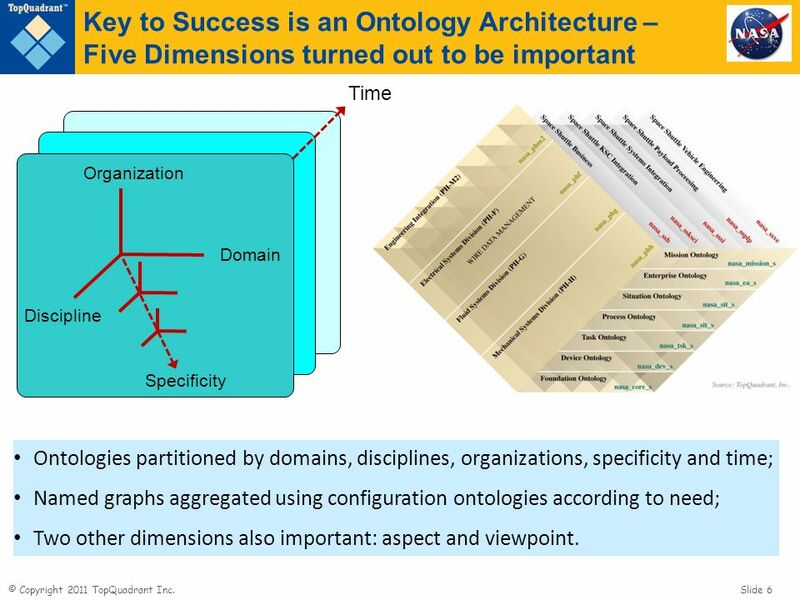 Time Organization Domain Discipline Specificity Ontologies partitioned by domains, disciplines, organizations, specificity and time; Named graphs aggregated using configuration ontologies according to need; Two other dimensions also important: aspect and viewpoint. 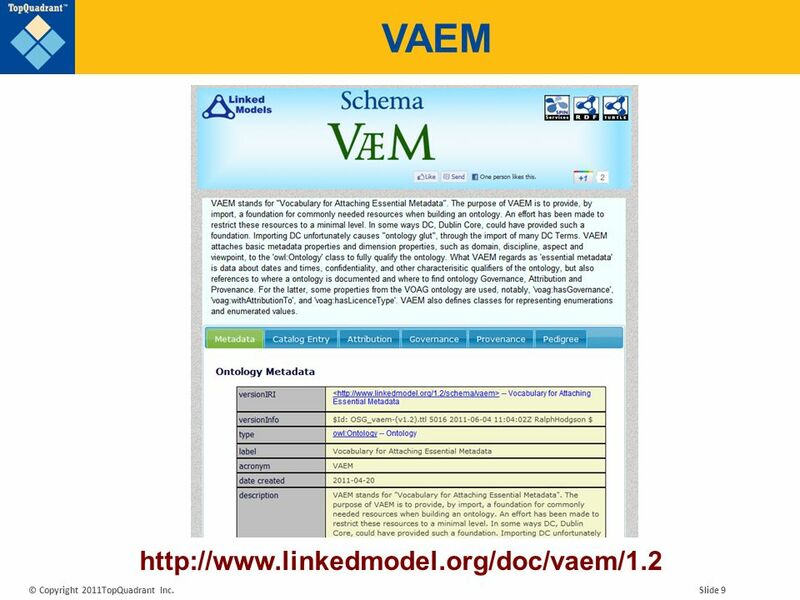 VAEM stands for "Vocabulary for Attaching Essential Metadata". 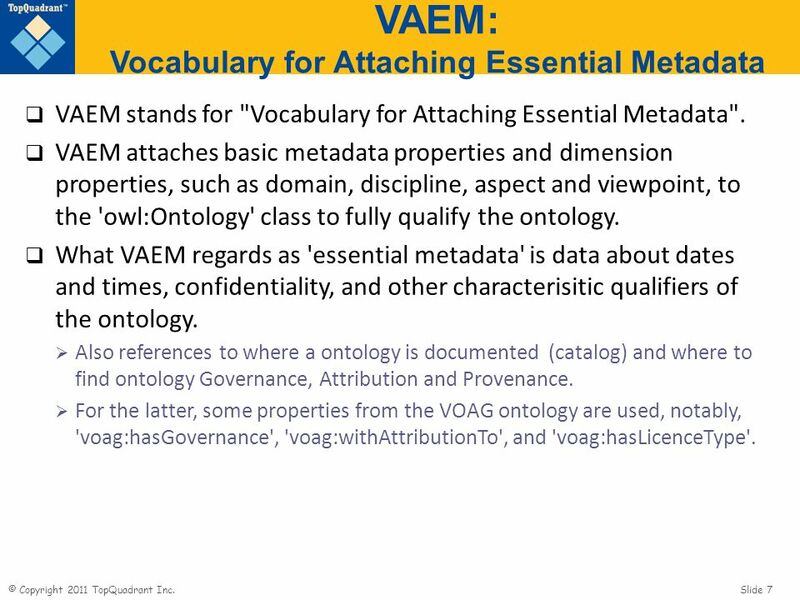 VAEM attaches basic metadata properties and dimension properties, such as domain, discipline, aspect and viewpoint, to the 'owl:Ontology' class to fully qualify the ontology. 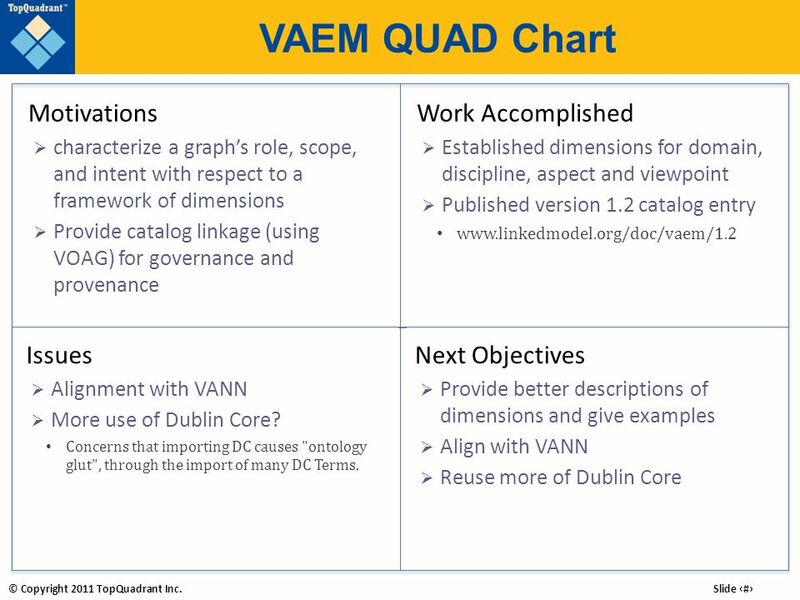 What VAEM regards as 'essential metadata' is data about dates and times, confidentiality, and other characterisitic qualifiers of the ontology. 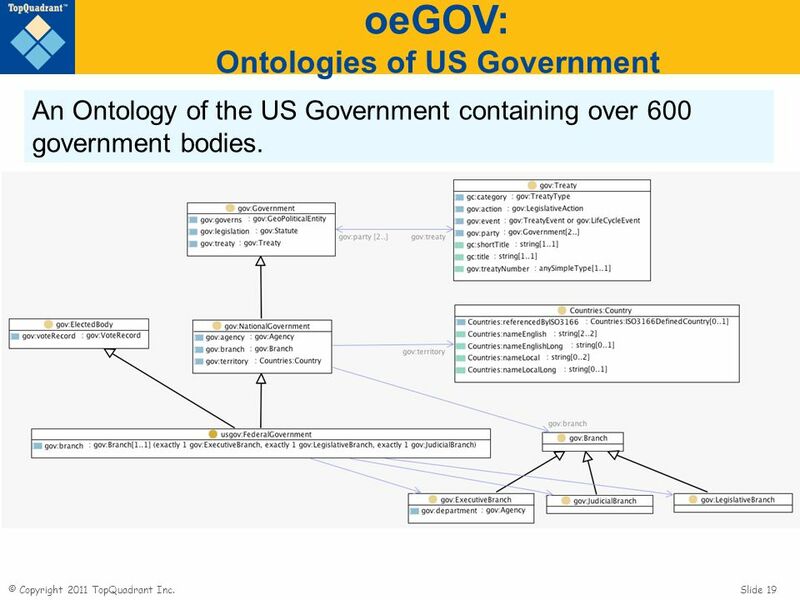 Also references to where a ontology is documented (catalog) and where to find ontology Governance, Attribution and Provenance. 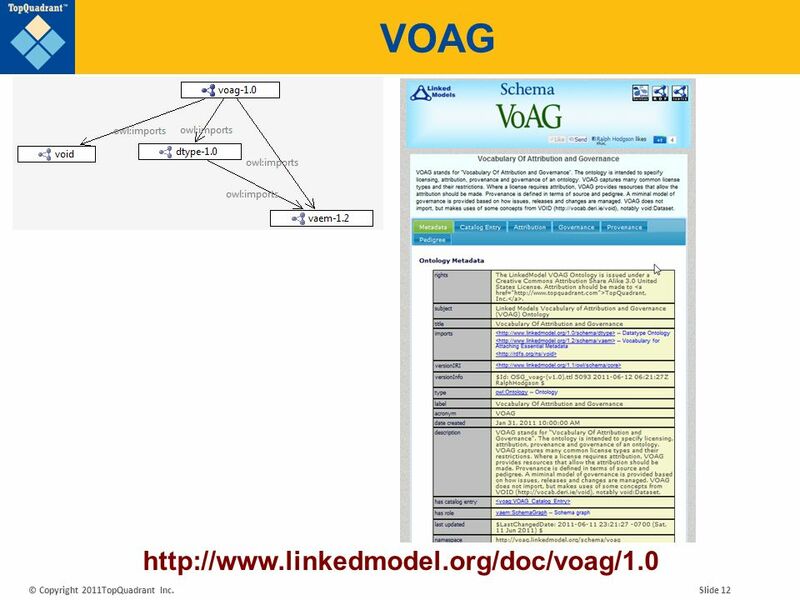 For the latter, some properties from the VOAG ontology are used, notably, 'voag:hasGovernance', 'voag:withAttributionTo', and 'voag:hasLicenceType'. 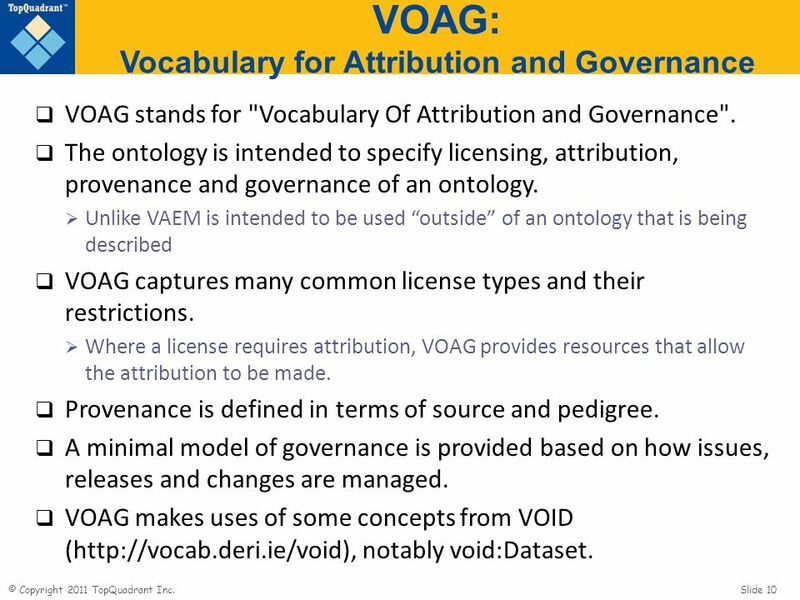 VOAG stands for "Vocabulary Of Attribution and Governance". The ontology is intended to specify licensing, attribution, provenance and governance of an ontology. Unlike VAEM is intended to be used “outside” of an ontology that is being described VOAG captures many common license types and their restrictions. 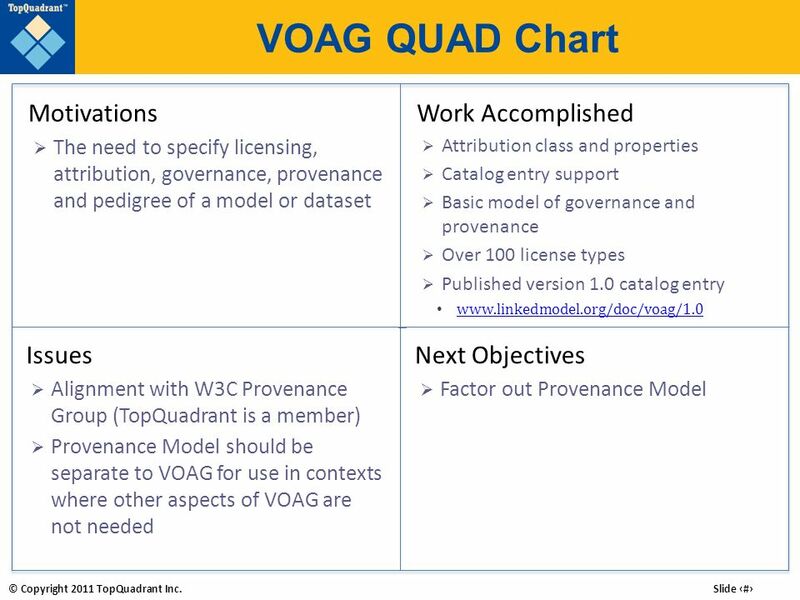 Where a license requires attribution, VOAG provides resources that allow the attribution to be made. Provenance is defined in terms of source and pedigree. A minimal model of governance is provided based on how issues, releases and changes are managed. VOAG makes uses of some concepts from VOID ( notably void:Dataset. 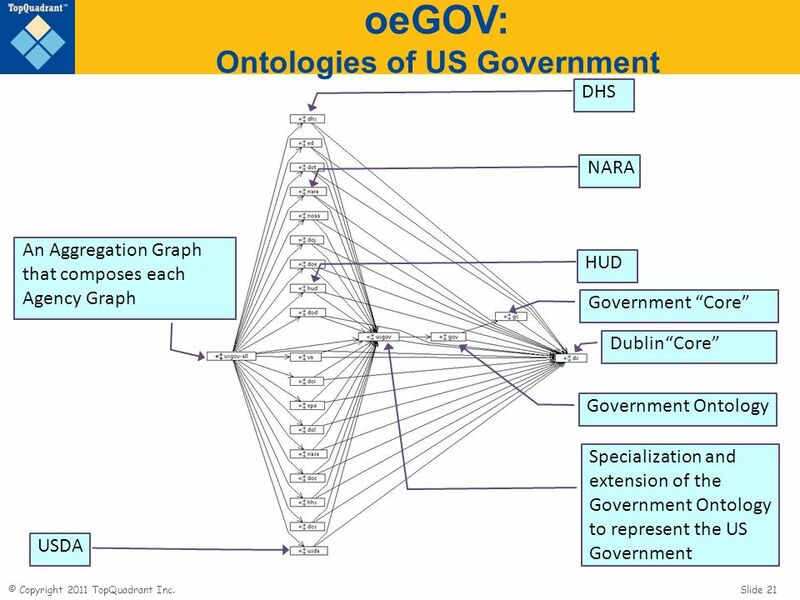 An Ontology of the US Government containing over 600 government bodies. rdfs:label "Department of Homeland Security (DHS)"^^xsd:string ; dc:description "Homeland Security leverages resources within federal, state, and local governments, coordinating the transition of multiple agencies and programs into a single, integrated agency focused on protecting the American people and their homeland. More than 87,000 different governmental jurisdictions at the federal, state, and local level have homeland security responsibilities. The comprehensive national strategy seeks to develop a complementary system connecting all levels of government without duplicating effort. Homeland Security is truly a 'national mission'. "^^xsd:string ; gc:url " ; gov:adminstration usgov:TSA ; gov:agency usgov:CG , usgov:SS , usgov:FEMA ; gov:center usgov:FLETC ; gov:committee usgov:HSSTAC , usgov:DHS-TFNA ; gov:council usgov:DHS-HSAC , usgov:DHS-NIAC , usgov:CIPAC , usgov:DHS-ICCEPID ; gov:department usgov:DHS-ICE , usgov:DHS-CBP ; gov:directorate usgov:DHS-DNPP , usgov:DHS-DST , usgov:DHS-DM ; gov:mission "The Department of Homeland Security’s overriding and urgent mission is to lead the unified national effort to secure the country and preserve our freedoms. While the Department was created to secure our country against those who seek to disrupt the American way of life, our charter also includes preparation for and response to all hazards and disasters. The citizens of the United States must have the utmost confidence that the Department can execute both of these missions. 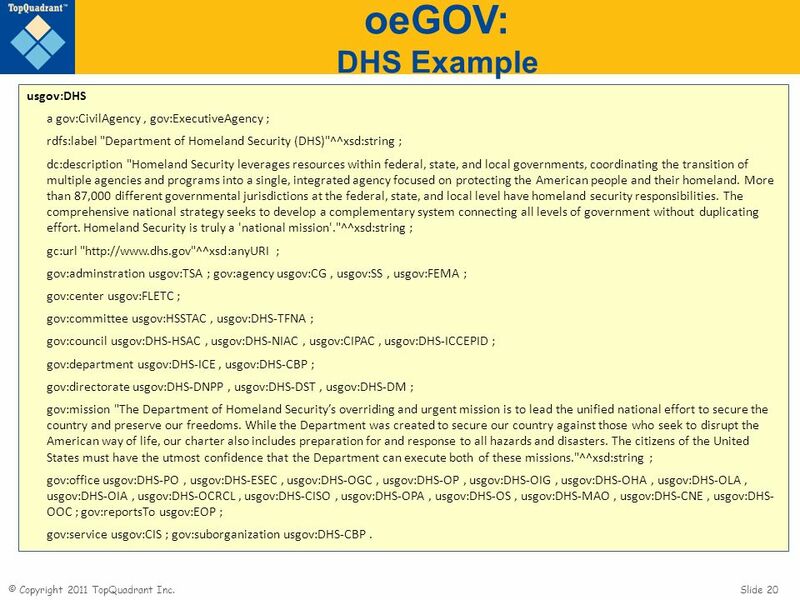 "^^xsd:string ; gov:office usgov:DHS-PO , usgov:DHS-ESEC , usgov:DHS-OGC , usgov:DHS-OP , usgov:DHS-OIG , usgov:DHS-OHA , usgov:DHS-OLA , usgov:DHS-OIA , usgov:DHS-OCRCL , usgov:DHS-CISO , usgov:DHS-OPA , usgov:DHS-OS , usgov:DHS-MAO , usgov:DHS-CNE , usgov:DHS- OOC ; gov:reportsTo usgov:EOP ; gov:service usgov:CIS ; gov:suborganization usgov:DHS-CBP . 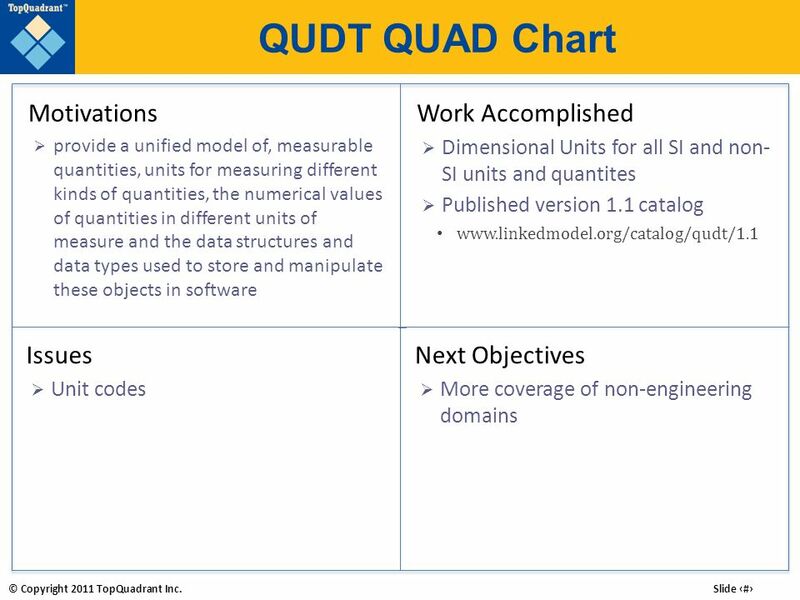 Download ppt "TopQuadrant’s Linked Models Ontologies: VAEM, VOAG, DTYPE, QUDT, oeGOV"
1 Formal Modeling & Verification of Messaging Framework of Simple Object Access Protocol (SOAP) Manzur Ashraf Faculty,BRAC University. 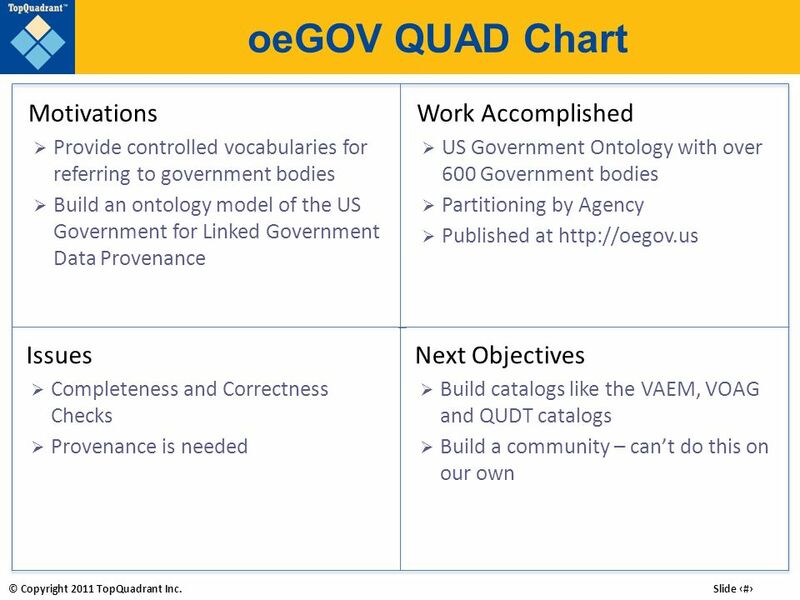 1 Federal DAS Data Quality Framework: July 2008 Build to Share U.S. Federal Data Architecture Subcommittee A Framework for Better Information Sharing.